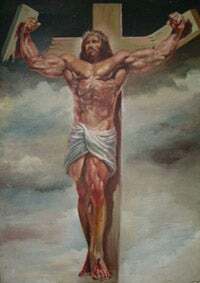 We found this over at Jesus of the Week, where they made the observation: "I think if this beefy Jesus were put on the stand in front of Congress, He would maintain, 'I'm not here to talk about the past. My message is steroids is bad.' "
Then the LORD said, "Rise and anoint him with the cream and the clear; he is the one." Actually, we're pretty sure this is a scene is from the Passion of the Christ director's cut.